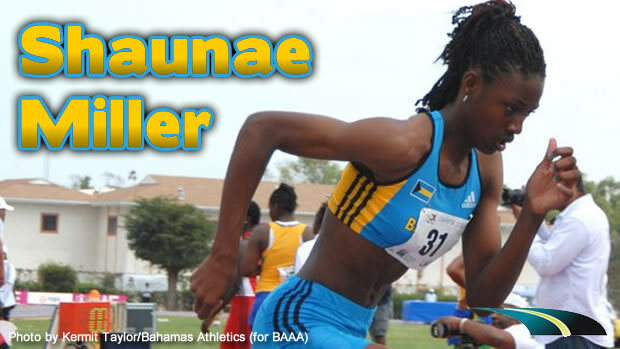 Shaunae Miller has another big day with a 52.92 that easily got her the win out of heat two! She will be the #2 seed in the finals behind top ranked Chrisann Gordon of Jamaica. Andre Wells of Grand Bahama Island also advanced to the 400 meter finals with a 47.36 for second in his heat. Kirk Lewis qualified for the semi-finals of the 110 Meter Hurdles with his 14.32 effort. That fifth place finish out of heat 4 squeaked him into the next round, where he'll be seeded 15th. It will take a big personal best tomorrow for him to make the cut for the finals, so cheer him on from this side of the ocean! Girls 100: Devynne Charlton's 12.33 placed her fifth in her heat of the 100 meters. Does not advance to finals. Boys 100: Delano Davis finished 7th in heat 1 with a 11.15. Tommy Outten had the same exact time out of heat 3.